Morris Kortick truly believed that G-d meant for him to design religious art work. 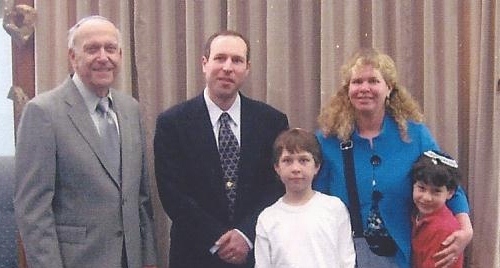 The journey to creating Temple Sinai’s ark curtain began when Morris studied as an apprentice toolmaker for several years before starting his own jewelry manufacturing company, Jewel Manufacturing. At Jewel, Morris created such popular jewelry designs that he was soon buying more Swarovski crystals than any other Swarovski customer in Rhode Island. This attracted the attention of the Swarovski family, so Daniel and Manfred Swarovski came to Rhode Island to find out more about Morris’ business. Soon afterwards, Jewel Manufacturing and Swarovski developed a formal partnership to develop and distribute designs using Swarovski crystals. Morris retired from jewelry manufacturing in 1980, but he continued to develop new designs using Swarovski crystals until his death in March 2011. Although a member of Temple Sinai for many years, Morris became more active after the death of Edith, his wife of 62 years. While attending his first High Holiday services after Edith’s death, Morris noticed the Temple’s old holiday ark curtain which was worn looking and completely unadorned. Morris always believed that an ark curtain should have some kind of meaningful symbolic design on it so he started thinking about what kind of ark curtain he could make for the Temple. While listening to Rabbi Peter Stein’s sermon that day, Morris heard the Rabbi quote from Genesis 15:5 where G-d says to Abram, “Look now toward heaven, and count the stars, if thou be able to count them…So shall thy seed be.” Morris realized that Swarovski crystals shine like stars and he thought to himself, “That’s creepy. It’s like G-d just told me the answer.” After researching the appropriateness of using constellations on an ark curtain, Morris learned that the Jewish people had identified constellations even before the Greeks had. In fact, some constellations are even mentioned in the Bible. Jews also have a long history of navigating by the stars and some even believe that Christopher Columbus’ navigator was Jewish. Feeling satisfied that his ideas had a strong foundation in Judaism, Morris began designing his first ark curtain, the one that was used prior to the current ark curtain. Being a perfectionist, Morris felt that he could improve upon his first design of the ark curtain so he almost immediately set out to design a second ark curtain, the one that is used currently by the Temple. Because of deep folds in the original curtain, not all of the crystals were visible, which resulted in less sparkle. The second ark curtain has no folds so all of the crystal “stars” and other religious designs can be fully appreciated by the congregation. He deliberately used 14,712 stones in the second ark curtain. In addition to the ark curtain, Morris has designed other religious items for the Temple, including the crystal designs in the downstairs hallway, the hangings in the chapel’s ark, a holiday Torah cover, and an elaborate chuppah. Also, during any service at the Temple, a quick scan of the congregation reveals numerous sparkly kippot (yarmulkes) and some tallitot, all a result of his handiwork. Through all these creations scattered around the Temple, Morris’ memory and spirit still shine bright. 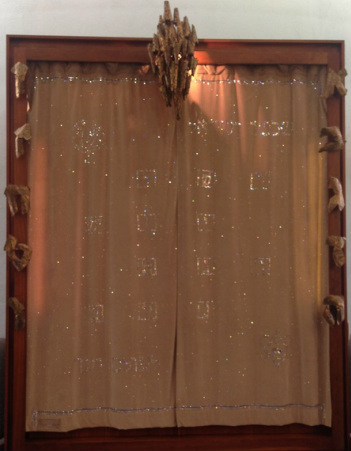 The crystals on our ark curtain are arranged in four columns (arba turim) of squares that represent the jewels on the shield worn by the High Priest in ancient Israel. Each square represents one of the twelve tribes of Israel. In Morris Kortick's design, each square has a Hebrew letter or letters that represents the name of a tribe. At the top of the curtain are the Hebrew words, "שבטי ישראל," "The tribes of Israel." At the bottom are the words, "לעולם ועד," "Forever and ever."